Kick off your visit on the 29th (Thu): tour the pleasant surroundings at Dubuji Boardwalk and then stroll through Mount Sorrow Ridge Trail. Get ready for a full day of sightseeing on the next day: admire all the interesting features of Marrdja Botanical Walk. To see traveler tips, other places to visit, ratings, and other tourist information, read our Cape Tribulation holiday planner. Use the Route module to find suitable travel options from Ingham to Cape Tribulation. September in Cape Tribulation sees daily highs of 32°C and lows of 22°C at night. Wrap up your sightseeing by early afternoon on the 30th (Fri) to allow enough time to travel to Perth. Visit Cottesloe Beach and Warnbro Beach for some beach relaxation. 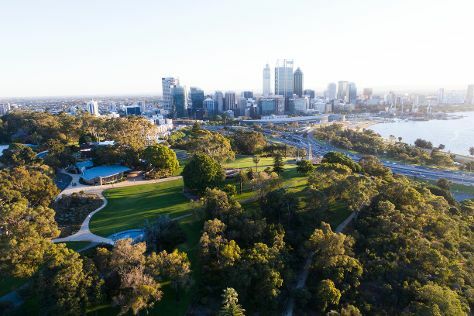 Take a break from the city and head to Kings Park & Botanic Garden and Perth Zoo. Explore Perth's surroundings by going to Caversham Wildlife Park (in Whiteman) and Rockingham (Penguin Island, Waikiki Beach, & more). There's much more to do: explore the activities along Swan River, tour the pleasant surroundings at Mettam's Pool, enjoy the sand and surf at Scarborough Beach, and take some stellar pictures from Fraser Avenue Lookout. To see traveler tips, maps, more things to do, and other tourist information, read Perth travel itinerary creator. Traveling by combination of flight, car, and car ferry from Cape Tribulation to Perth takes 9.5 hours. Alternatively, you can drive; or do a combination of train, car, and car ferry. Traveling from Cape Tribulation to Perth, you'll gain 2 hours due to the time zone difference. Expect a bit cooler weather when traveling from Cape Tribulation in October: highs in Perth hover around 27°C, while lows dip to 11°C. Finish your sightseeing early on the 7th (Fri) so you can travel back home.